The National Highway Traffic Safety Administration (NHTSA) has revealed the number of traffic deaths last year increased 5.6 percent to 37,461 fatalities. Despite a decrease in the number of fatalities related to drowsy and distracted driving, the report said there was an increase in deaths related to "reckless behaviors" such as speeding, not wearing seat belts, and drinking and driving. In particular, there was a 2.2 percent decrease in the number of distraction-related deaths but it still resulted in 3,450 fatalities last year. The number of deaths related to drowsy driving also decreased 3.5 percent to 803 fatalities. The other numbers aren't nearly as good as there 10,497 fatalities related to drunk driving and 10,111 fatalities related to speeding. These represent increases of 1.7 percent and 4.0 percent, respectively. Perhaps the saddest statistic is the fact that there were 10,428 fatalities last year due to people not using a seat belt. In many cases, these deaths could have easily been prevented. Last year also saw significant increases in motorcyclist (5,286 fatalities) and pedestrian deaths (5,987 fatalities). The latter figure is an increase of nine percent and is the highest number recorded since 1990. The report goes on to note human choices are linked to 94 percent of serious crashes and the agency continues to support vehicle technologies that "may eventually help reduce or eliminate human error and the mistakes that drivers make behind the wheel." 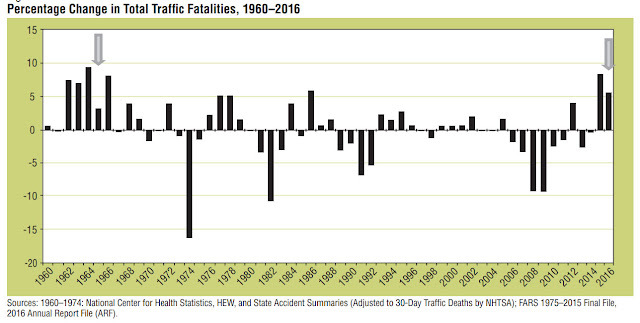 0 Response to "U.S. Traffic Deaths Climb 5.6 Percent, 10K+ Killed Due To Not Using Seat Belts"